I was really to busy to read the email but my head just needed a break from thinking. If it had been about clothes or shoes I would have deleted it without opening, but it was plants. Not just plants, but plants on SALE. I told myself there was no harm in just looking. It was usually only the culinary herbs that were on sale, not often did I see medicinal herbs on a good sale so I didn’t see any harm. 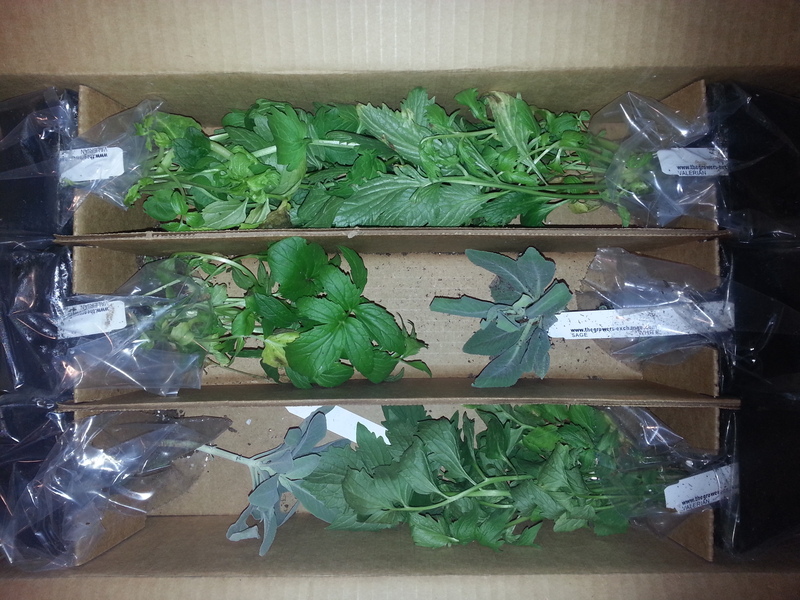 A box arrived a few days later with 18 new plants. It was a good sale. Of course new plants meant they needed to be planted somewhere. Now was the time to build the spiral garden I had been wanting. The first time I saw a picture of a spiral garden I wanted one. It is so me. 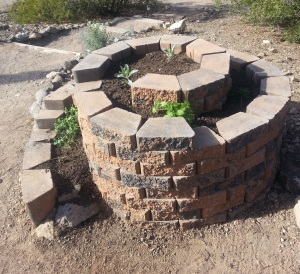 Combining a spiral with plants….genius! A spiral garden is a compact vertical garden that allows you to plant a larger variety of plants in a limited amount of space. The spiral structure naturally creates both sunny and shady spots in the garden. The downhill slope allows water to flow to the bottom for plants that need more moisture and leaves a drier planting area at the top. The bricks used for the structure hold heat and insulate the plants in cooler weather. Also the plants are in a raised bed and easy to reach. I secretly picked out a spot and then tried to casually tell Tom what I thought would be a nice addition to our yard. He knew the game. I wanted one and he was going to have to figure out how to build it. I did a poor job of explaining a spiral garden so I showed him some pictures and a YouTube video of how to build one. He loved the idea and began sketching what it would look like. It turns out that you can build a beautiful spiral garden in a weekend! I planted white Sage at the top since it likes the dry heat. In addition there is Lemon Balm, St John’s Wort, Peppermint, Oregano and garlic Chives. There is still plenty of room. So you know what that means…..more plants needed! It is full blown summer here in the desert and we struggle to keep hydrated. One refreshing way to stay hydrated is with herbal iced teas. For nourishing refreshment, nothing quenches better than herbal iced tea. Iced herbal tea is delicious on a hot day. Unlike regular iced tea, the herbs impart delicate and refreshing flavors that do not need artificial additives or sugar. And the taste is great. Extremely simple to make, herbal iced teas start out just like regular hot tea. The trick is to use enough herbs. 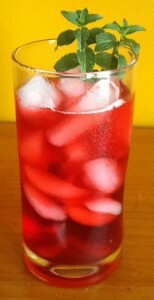 For iced teas you want to make a slightly stronger brew to allow it to be iced down. You can make herbal iced teas by the glass or make a big pitcher to keep in the refrigerator for immediate gratification! To make herbal iced tea simply put fresh or dried herbs in a suitable container, pour boiling water over herbs, cover and allow to steep. Remove herbs, add ice and enjoy. Herbal iced teas can be made with just one herb, such as mint, or with a blend of different herbs to create your own unique tea. One of my favorite blends for making herbal iced teas is our Desert Delight. 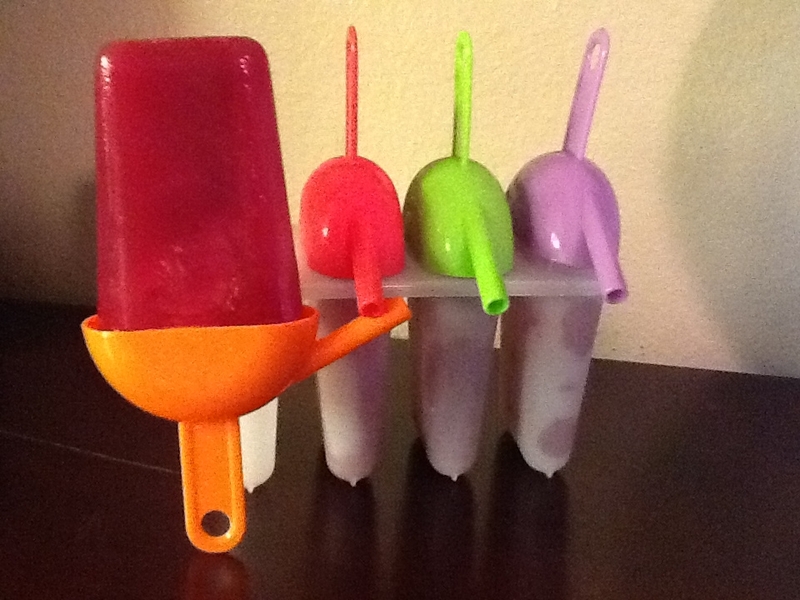 A refreshing combination of Lemon Balm, Lavender, Peppermint and Hibiscus, it also freezes into popsicles that make even big kids smile. Some herbs and flowers suitable for iced tea include: Peppermint, chamomile, spearmint, lavender, wintergreen, lemon balm, dandelion flowers, angelica, elderflower blossoms, geranium leaves, lemon verbena, licorice, nettle, parsley, anise, caraway, oregano, chicory, hibiscus, ginseng, jasmine flowers, marigold flowers, rose petals, sage, etc. Steep peppermint, rosehips, orange peel, hibiscus, and lemongrass in the two cups of water. Strain. Add orange juice and refrigerate. When ready to serve, pour over ice cubes and add a splash of sparkling water to each glass. Sweeten if desired. Steep lemongrass and lemon balm leaf in the water. Strain and add honey and ginger ale. Add floating slices of fresh lemon to your punch bowl, and/or include a slice or two of crystallized ginger in each glass.